Like Andres Salomon I too have had my business cards with a GPG fingerprint be obsoleted. For me, however, it happened because I gave the printers the wrong fingerprint: the one for a special purpose key (comp.os.linux.announce moderation, I think), not my usual key. That was a nice "oops" moment. These days, if I need fingerprints on paper, I print out copies of a little design I did with glabels, not liking the output from various existing key-to-fingerprint scripts I tried. I only print as many as I need, though, which is easy now that I have a working printer again. Just when I thought nothing could save this week from being an utter disaster, I learn about this: the Lisp logo set. Absolutely hilarious! Today I sat for about an hour in Cafe Lasipalatsi in the center of Helsinki. During that time I saw five Apple laptops and one Sony Vaio. All of the Apples were used by people at different tables, except for one couple who had one each, and also swapped them with each other. If I didn't know better, I'd assume Apple has taken over the world. At least one of the Apples was running Linux, though. This Hackles web comic describes the hierarchies among UNIX geeks. They forgot one: between "pig", for script kiddies, and "dog", for knowledgeable user, they are missing at least one, namely "chicken", for Windows-user. Finnish politics, skip if you're not interested. The Finnish parliament is in the final stages of revising copyright laws based on the EUCD directive. The process has been long and complicated, and both the government and lobby organizations for the entertainment industry have been happy enough to trample on citizen's rights at will. Lately we've learned that some civil servants who prepared the law also worked, or now work, for said lobby organizations, which seems rather improper to me. If you like to watch movies or listen to music on Linux, even in the future, from as yet unreleased formats (like, say, the successor of DVDs), you really do want to come there. Even if you just stand with other people, it will have an effect. Banderolls are optional. I've no idea how many Finns read my web log, but at the demonstration against software patents, several people told me they'd only heard about it here, so that's why I thought I'd be a messenger again, it's for a good cause. Cutting down on ice cream, I need an alternate source of calcium, and cheese seems to be recommended. Cheese sandwiches for breakfast it is, then. To introduce myself to the wonderful new world of cheeses, I bought a nice triangular piece that doesn't smell very bad. It even tastes quite nice, but damn, it's hard to use. The first slice was easy, and the second one as well, but after that things started to go bad. Bits of cheese started to break off, and regardless of how hard I tried, and I tried with quite a lot of force, I was unable to make a third good slice for my sandwich. The harder I tried, the more bits would fly around, until the entire table, my copy of Terry Pratchett's The Fifth Elephant, and myself were covered in cheese crumbs. How's that for difficult food? I eventually had to resort to gathering a small pile of cheese crumbs and pound on them with my fist to make what I might have described as a cheese kludge, if I hadn't been in an uncharitable mood, so I used stronger words. The moral here is that it's not enough for something to be easy and comfortable for the first slice or two, it has to be easy and comfortable all the way to the last slice. HAPPY BIRTHDAY TO YOU HAPPY BIRTHDAY TO YOU HAPPY BIRTHDAY TO YOU JESUS CLIMENT HAPPY BIRTHDAY TO YOU! While at Debconf5, I watched about 180 people do a key signing party. It took about two and half hours. I think that's crazy. It's too many people and too long a time for everyone to be alert and properly check everyone else's identification papers and other things. Also, it takes way too long. I'm thinking that a faster system that didn't try to make everyone sign everyone else's key. Instead, put everyone into a square matrix and then have everyone in the same row check each other's fingerprints and IDs, and then likewise for each row. This way, everyone in the entire group has at most a two step path to everyone else, which should be a pretty good web of trust. Since the length of a row or column is the square root of the number of participants, you only need to check twice the square root of people. For 180 people, that's 26 to 28 people. Much much faster. Obviously, you don't need to move people physically into a matrix. You can just give people a piece of paper giving their row letter and column number and have everyone in the first column or row gather their row or column around them. I think this would work. I don't know if anyone's actually done it already, and probably about a zillion people will now jump at the opportunity to mail me about all the flaws in this scheme. Now I have participated in a public protest demonstration against something, namely, software patents. There were around sixty people, and it went well, given how suddenly it had to be arranged. There was little press, and only a few members of parliament were confronted, and those only a little. Jyrki Kasvi talked to us at length, but then he's generally clueful about why software patents are evil. Much praise to mjr for taking the initiative for this. Something organized with a bit of advance warning would probably be fun. Might be possible to get a few hundred people, if publicized properly beforehand. There is going to be a demonstration against software patents in Helsinki in about four hours. For more information, see the invitation. Nokia has announced the Nokia 770 tablet pc and the free software development kit for it. That's free as in free speech and free software, not free as in beer. Open source, if you prefer. It's true: the machine runs Linux, and the SDK is free software. This is cool. When I was hired by Nokia last year, that's the product I was to work on. The device has a coolness factor that was great enough that it made me sad to leave Nokia after only six weeks of employment. It would have been nice to have been part of the development team for something like that. The reason I left Nokia, my unhappiness with their patent policies, hasn't changed. Apart from announcing the new gadget, Nokia also announced their patent support to the Linux Kernel (the press release). This seems like a nice move, but as far as I can tell, it is only a PR move to make Nokia look good. It doesn't help free software. The Patent Statement applies to Nokia's patents infringed by current official releases of the Linux Kernel and all future official releases of the Linux Kernel to the extent that Nokia has not declared new functionality embodied in such releases to be outside the scope of the Patent Statement. With respect to new functionality introduced into future Linux Kernel releases, Nokia reserves the right to declare that the Patent Statement shall not apply. This makes it clear the patent statement applies to official Linux kernel releases only, and only the stuff that is there now. Every Linux distribution I know of uses kernels they have patched themselves, not the official ones. New features in new official versions might or might not be covered. Obviously, were someone to fork the kernel, they'd be risking patent litigation as well. Any other free software also gets no help from this. Indeed, given that copying code between projects is common practice, people may have to start being extra careful when they copy things out of the Linux kernel. On the whole, I don't think Nokia is evil for making this press release and patent statement. I suspect that their intention is good, as far as this press release is concerned. It doesn't do all that much to help free software, but I don't think it does any direct harm, either. Nokia still lobbies hard for software patents to become legal in the EU. As far as I know, and that's not much since I don't have any relevant contacts inside Nokia, nothing in Nokia's attitude towards patents has changed. My reasons for leaving them haven't changed. If you're an EU citizen, please write to your country's representatives in the European Parliament and explain your stance on software patents. Writing to your national parliament is also a good idea. Write today or regret forever. I have started a company with a dear friend of mine, Anu: Winnow Utility Fans, Inc. We're gonna be so rich! My "man date" entry from yesterday has sparked an unprecedented flood of feedback: two mails. Both indicate that the homophobia in the article is in fact only something that applies to the author of the article, or possibly the New York Times, or at the very worst, to newyorkers. Most of the rest of the country, especially the west coast, is sane. I should have known that as soon as I find something tangible about the US to mock, it turns out I am just being silly. Ah well. The Finnish word "talkoot" describes the situation when people work together without direct compensation to help someone out (e.g., to help a neighbor build a barn), or to achieve a common goal (to build a mill for the village). You won't get paid for a talkoot event. There might be food and drink, but no salaries or wages. You might participate because the end result might be beneficial to you: you get to use the mill. You might participate because it helps build loyalty within the community: if you help your neighbor today, your neighbor will help you tomorrow. Or you might participate because it is simply the right thing to do: helping someone in need even if they won't ever be in a position to help you. There is a fairly strong emotional factor involved about a talkoot event being fair, that no-one should exploit it. For example, if all the village participates in building the mill, they should not have to pay for the use of the mill. If the mill needs some income to cover running costs, it is fine for the villagers to have to pay for those, but turning the mill to a commercial enterprise and maximising profits is going to tarnish everything. The villagers built it. If you exploit them commercially, they are going to be less enthusiastic about the next talkoot event. Many things that have been enabled by the Internet could be described as talkoot. For example, the CDDB database was originally created by people adding what CDs they had into a shared database for the benefit of all. Then, at some point, the database was so useful to so many it could be turned into a business. And so it was. This made many people quite sour. Luckily, on the Internet, it is easy build a new mill. As a result, we now have FREEDB, an explicitly free replacement of CDDB. Many people work on free software in the spirit of talkoot. They will happily build software with other people, and let anyone use the software for free. It is even fine for people to use the software to make money using the software, as long as the software remains free (in the "free speech" sense; see here). If, however, someone wants to profiteer on the software, to take a piece of free software and turn it into a piece of proprietary software, things get sour quickly. For example, the Linux kernel is used in many embedded devices, and some manufacturers have decided to violate the GPL license by not giving their customers the full source code, or any source code. Many people, especially the developers, dislike this. See, for example, the gpl-violations.org site for an example of a reaction. This entry was sparked by my introspection about the strong reaction I had about a fairly minor event in the Finnish web log scene. Some years ago, Sami Köykkä set up in his free time a web service to track when web logs were updated. Then, and still, many web logs are just plain old HTML pages, with no RSS feeds, and so most aggregators don't work for them. This one did, since it checked whether the page changed at all. It was a nice service, simple to use and worked well, so it quickly gained much popularity. All was well. Earlier this year, the service moved to a dedicated domain and had been rewritten. It now requires registration and has advertisments. Then, this week, the service was sold to an investment company. On the one hand, since all the implementation was done by the one person, in his free time, it is nice to see him get compensation. On the other hand, I feel that the new situation is somehow similar to the village mill turning into a commercial enterprise. This feeling is a bit strange, since I did not participate at all in the building of the service. I did, however, participate by writing a web log: without me, and the thousand other web log writers, the service would not be a success. Thus, on a silly emotional level, though it is hard to explain, I feel I have been part of a talkoot event. A very small part, though. Almost all the hard work was done by that one person. Therefore, my reaction to this chain of events was the following: I am glad, and very satisfied, that Köykkä got paid for his work. In fact, it makes feel the world is a better place. At the same time, I don't want to participate in the spirit of talkoot in a commercial enterprise. The new service is clearly commercial. I don't know how they intend to make money out of it, but I don't want them to use my pulpit, my opinions, without compensation. Therefore I asked them to remove my log from their web log list, which they promptly did. Of course, since I seem to have had only a couple of dozen readers via the service, it was easy for me to drop out. Most of my readers come via Planet Debian and that is also the audience for I most write for. I have not been much involved in the Finnish web log scene. At the same time, I have also stopped using the service myself. At best I think I had around twenty logs there, but when I discovered rss2email, thanks to Joey Hess, I have moved to using that almost exclusively. I only had three more logs remaining at Köykkä's service and checking those manually won't be much of a hardship. I have a dozen other places I check daily (web comics and such), three more won't make a difference. 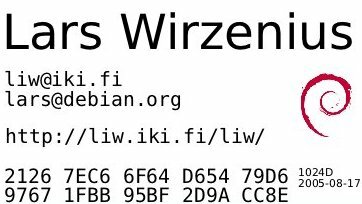 I wish Köykkä and the new commercial Finnish web log list all the best, even though I won't be participating, either as a writer or a reader. On IRC, in the midst of a random discussion, someone made references to George Orwell's 1984, and the "ten minutes of hate" sessions in the book. I suggested that doing "ten minutes of love" would be more constructive, and then proceeded to express my positive feelings towards GNOME for ten minutes. Below is what I wrote. I wrote checklist for free software web pages. I have often been annoyed by web pages that are missing essential information so I figured I might as well list the essentials and point people at the list if they need guidance. I actually wrote it a month ago, but forgot to make it public. Fighting fire with fire: European Anti-Software Patent Bribe Pledge Drive. I'm not sure I like the idea of doing bad things in order to combat bad things, but this time, the idea is funny. Perhaps I'm just overly desperate. I suggest that people not, I repeat, not send bananas by mail to Luxembourg and other parties. They might rot and harm other packages and letters. I don't understand music, except in a very shallow listening-only sense. I don't understand musical notation. When I was put into piano school, after five weeks the teacher said it would be best if I stopped. However, I like typography, and if for no other reason, the Mutopia project is cool. They have sheet music, mostly classical. A bit like Project Gutenberg. Some people I've asked who understand something about music also say it looks cool. I really like windows. They are quite a practical way of allowing natural light to reach the inside of a house. Natural light looks better than flash light when you're photographing. Researchers in academia or companies are usually required to keep a "lab journal" or "lab notebook", where they write down everything they do while they work. Every experiment, its method and results, regardless of whether it turned out to be a good idea or not. This is useful for, among other things, proving that you invented something or that you didn't. Lab notebooks are kept on paper, preferably in bound books with numbered pages, so that it is clear that no pages are missing. Writing should be from one edge of a page to the next, so that nothing can be added. Each page should be signed daily or weekly by the researcher and someone else to prove dates. And so on; there are lots of things done to make it as likely as possible that the notebooks will be accepted as proof in a court of law. For various reasons, I've been thinking about ways of doing this elecronically. What I've ended up with is this: the text for each day (or maybe week) is written in its own file, and that file is signed by the author, and then by someone else. In order to keep things secret, the other signer might sign only a detached signature of the original file, or its encrypted version. Files are named with consecutive numbers so that it is clear that nothing is missing (one might not work every day). This might even be automated, to some degree. I think it would work, but it is anyone's guess whether it would hold up in court. Depends on the court, I assume.